Holy Zamboni. I can't believe the countdown is almost over. Only a 2 more days until I am living with a 3-year-old. So how has your day been? Mine has been not too shabby. Thanks for asking. I just got done getting the babies ready for bed, and I just paused to look at myself in the bathroom mirror. And I laughed because I look awesome. Totally ready to rock a GQ cover. My sweatshirt has milk stains on both shoulders, there are two mustard stains right in the middle, I have muddy paw prints on my pants, and my hair looks it just got manhandled by a pair of horny squirrels. So you might understand why I was fantasizing about winning the $500 million Mega Millions jackpot tomorrow? 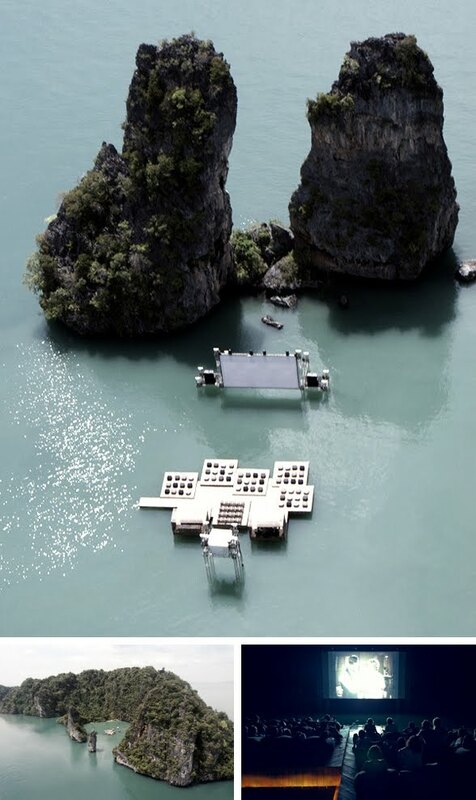 I mean there is a lot of stuff I would do but one of the things I definitely would do is rent out this floating movie theater. I mean check it out. How cool is this place? It would be amazing to pop in "The Big Lebowski" or "Casablanca" or "Star Wars" and just enjoy the heck out of the experience. Of course you would all receive an all-expenses paid invitation to Mr. Shife's Movie Fest. Well I gotta go the phone is ringing. Probably GQ. That is so fantastic! I will have to remember to buy a ticket in case you don't win. Hey... there is nothing sexier than a man who puts his all into taking care of his children. Nice one. And I bet you didn't think to take a picture of you and your stains and untidy hair. A lot of people dreaming about the big drawing tonight, me included. I'd be happy to split it with you though and I'd even chip in to buy you some new clothes for the cover shoot.